A great deal of the joy that goes with collecting coins is being able to display them in an entertaining, informative and appealing way. These do a stellar job of performing all three of those tasks. Not only are they light, durable and easy to insert, they are visually appealing. 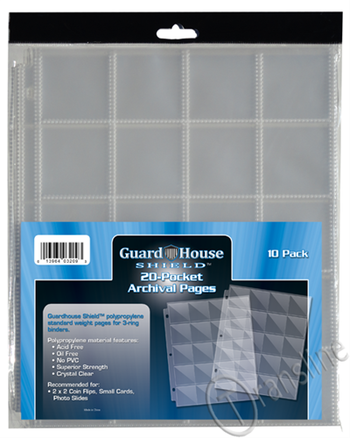 The Guardhouse Shield Polypropylene 20-pocket Archival Pages come in packs of 10 and we have plenty in stock at Coin Supply Planet. Another added benefit of these coin album display pages is that it allows you to really compare coins and how they are different. For instance, you could own a complete set of Buffalo Nickels and be able to look at how they differed in the years they were minted. 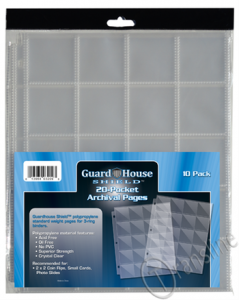 Unlike many coin tubes, these Guardhouse Shield Polypropylene Pages also allow for careful examination and comparison on different grades, different years and different strikes. You can use this product to set up a grading page in any coin album where you can categorize by type graded from Fair all the way to Mint State 70.